Having installed node locally your easiest option for starting development is to open a text editor (notepad, sublimetext, notepad++, whatever) and to launch a command prompt. Create an initial node file, say app.js, put some content in there (such as console.log(“hiyaa”)) and save it. Now let’s move from command line development to web development. Save, refresh your browser… Huh? Nothing’s changed? You need to restart the node process in order to pick up the changes to the code; your first port of call will be hitting Ctrl+C, up, enter. Save it and notice that your command line has output an alert that the file change has been detected and the node process is restarting. Refresh your browser and you’ll see the changes already available. Hurrah! The majority of this next section is lifted from the best node.js introduction tutorial, nodebeginner. I won’t rewrite too much of it, I’d suggest you read that post if there’s anything here I gloss over too much. So far we’ve seen how to use a single file to run a basic web server. Using the concept of “exports” we can set this up as a self-contained module (modules are a key concept in node) and reference it from a different initialisation file. You can see that the same functionality is in there, except that the module now returns a function instead of executing the code; no server is actually created yet. Firstly, there’s the reference at the top to “./server” – this just links our server.js file so that we can call the “start” function that we exposed from that server.js file. Secondly I’m now passing in the port to use; either the current process’s environment setting (useful for deployment later on, when you can’t control the port your process will actually run on) or default to 3000 (for development purposes). 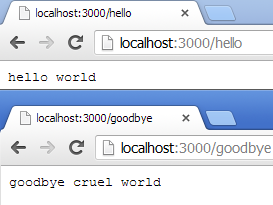 Now kick off node and point it at “app.js” – the same familiar “Hello world” text should greet you in the browser. That’s all well and good, but it’s not much use displaying “hello world” all the time. Firstly, let’s introduce the (exceptionally) basic concepts of routing. Fire up nodemon pointing at app.js and visit http://localhost:3000/hello to see the route “/hello” rendered magnificently on screen. So adding new content is a case of defining a function to return content and registering a new route. That second one is the browser asking for the favicon. You can either register a route to return an HTTP 200 and nothing else (in order to avoid 404s) or you can create a route and send back an actual favicon. Notice the “favicon” function reads in the icon file from the filesystem and also sets the content type to “image/x-icon”. Oooh – pretty. So adding new content is a new request handler and registering a new route, and outputting a different content type if necessary. So that’s the basics of serving web content via node, including basic routing and content type manipulation. Next up: a basic RESTful API in node which I’ll be using for several of the other 101 projects throughout this year.